The beginning for this Minnesota based band was in 1962 and consisted of Dal Winslow (rhythm guitar & vocals), Tony Andreason (lead guitar & vocals), Bob Reed (bass guitar & vocals), and Steve Wahrer (drums & vocals). It didn't take long for the group to become one of the most dynamic and popular bands in the Upper Midwest. Within a year their hit record "Surfin Bird" was the number one song in the country. They followed that successful record with several more charted hits and over a dozen albums. Most music authorities consider the Trashmen the number one garage bands of all time. 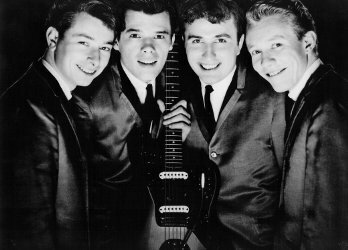 Not only did the Trashmen have commercial success along with an enormous fan base but their contemporaries praised them as outstanding musicians. The band broke up in 1967 but reunited with the original members in the 1980's. Unfortunately they lost Steve Wahrer to cancer in 1989 but Bob's son Rob Reed has taken his place on the drums. Even after 45 years the Trashmen name is easily recognized and their music continues to live on.